The City of Tel Aviv hosted the first Thematic Meeting on Civic Engagement on September 7th 2015, within the 6th session of the Cities Summit. 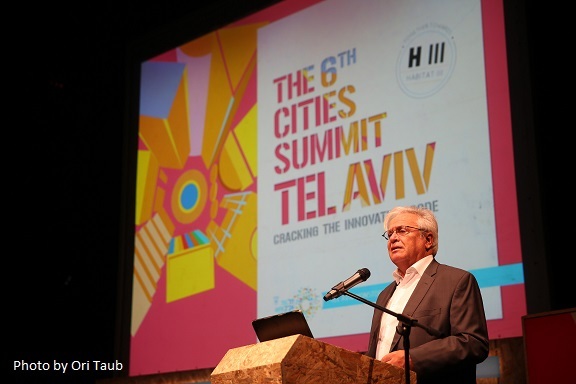 In his opening remarks, the Secretary-General of the Conference, Dr. Joan Clos, thanked the municipality of Tel Aviv for hosting the meeting and for covering a matter of crucial importance for the New Urban Agenda. “The engagement of citizens in urban issues remains the essence of urban life, as the majority of todays´ world population is urban”, Dr. Clos said. In this sense, the Secretary-General reiterated the importance of moving from participation to engagement. In addition, he affirmed that “in order to have a more peaceful society, we need civic engagement to become real”. He also emphasized the interconnectedness of civic engagement and governance in service provision, accountability and transparency as well as in reducing inequalities as of strategic relevance to the new urban agenda. Dr. Joan Clos took the opportunity to brief the participants about the upcoming adoption of the Sustainable Development Goals (SDGs) and its immediate links with sustainable urban development. He highlighted how urbanisation has become a driving force as well as a source of development with the power to change and improve lives. With regards to the New Urban Agenda, he stressed that a huge challenge ahead of us is to reduce greenhouse gas emissions at the same time as the urban population will increase by three billion people in the next thirty years. Dr. Clos advocated for the urgent need to address the social and environmental dimensions of the future urban model, with the objetive of making cities inclusive, safe, resilient and sustainable. The agenda of the thematic meeting was also marked by a series of activities which included a panel discussion on the current urban challenges with the Mayors of Tel Aviv, Mr Ron Hudai, and Amsterdam, Mr. Eberhart Van Der Laan, the Deputy Mayor of Paris, Mr. Jean-Louis Missika, and the Deputy Mayor of London’s municipality, Sir Edward Lister; an executive meeting with world urban experts, as well as an Urban Journalism Academy. In addition to the online consultations on Civic Engagement launched on this website, all participants of the summit -over 1,000- were asked to contribute to the definition of the final outcome by sending text messages and comments to an online platform. The outcome document of the thematic meeting will be officially released on September 20th 2015 as the Tel Aviv Declaration on Civic Engagement.